Working away from London allowed Nash the intellectual and physical space to develop his art. He not only carves wood, largely from fallen trees, with chain and milling saws – skills that he has perfected over the years – but he also creates sculptures from growing plants, cutting and training them into domes or ladders. His famous Ash Dome, planted as saplings in 1977, is now a mature dome centred on a plot of woodland in North Wales, Nash’s ‘laboratory’ for growing works and a place for thinking. Nash studied at Kingston College of Art from 1963 to 1967 and at Chelsea School of Art (Postgraduate) from 1969 to 1970. His first solo exhibitions were held in 1973 at Queen Elizabeth Hall, York and at Oriel, Bangor, Wales. These led to a series of solo exhibitions throughout the UK and his international reputation was established after his first solo shows overseas were held in 1980 at Elise Meyer Gallery, New York and at Galleria Cavallino, Venice, Italy. He has continued to hold solo shows on an annual basis throughout the world. Nash’s work has also been included in numerous international key group exhibitions since 1970. These include The Condition of Sculpture, at the Hayward Gallery, London in 1975, British Art Now: An American Perspective, at the Soloman R Guggenheim Museum, New York and tour in 1980, British Sculpture in the Twentieth Century, Part II, at the Whitechapel Art Gallery, London in 1981 and Aspects of British Art Today, at the Tokyo Metropolitan Art Museum in 1982. More recently his work was included in Here and Now, at the Serpentine Gallery, London (1995), Sculptors’ Drawings 1945-90, at the Metropolitan Museum of Art, New York and The Shape of the Century: 100 Years of Sculpture in Britain, at Salisbury Cathedral and Canary Wharf, London (1999). In 2000 his work Cube, Sphere, Pyramid was purchased by the Chantrey Bequest for the nation. 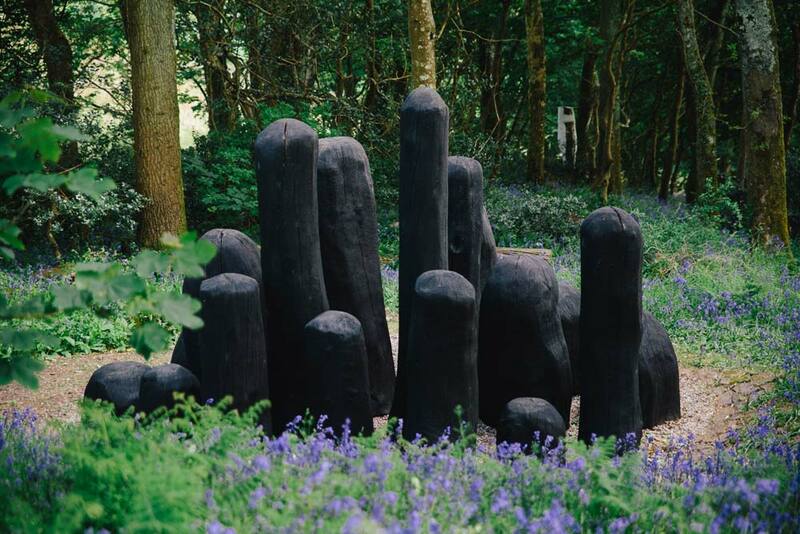 David Nash’s Black Mound, a powerful collection of charred oak shapes in a sculpted huddle, can be viewed at Tremenheere Sculpture Gardens. Yesterday's Garden Project Day was very productive! Thanks to those who came along & thanks to the @thehoneypotpz for the wonderful lunch & Barbara for delicious homemade cakes. We may do similar event in a few weeks time, please email tom@tremenheere.co.uk to express interest.